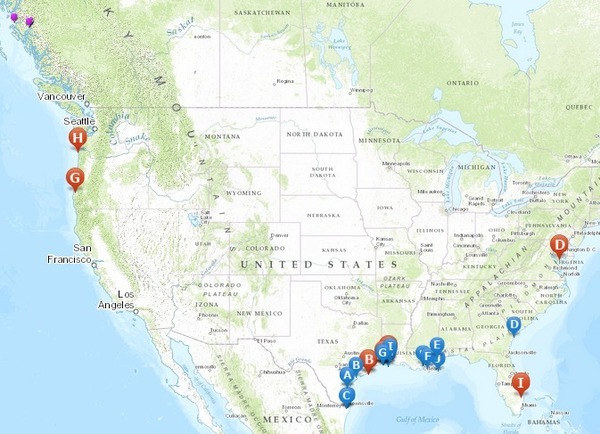 In addition to the approved LNG import and export terminals, there are more on this FERC map of Proposed North American LNG Export Terminals, including ones in Lake Charles (2 and 7), Sabine Pass (6), Plaquemines Parish (8 and 11), and Cameron Parish (13) Louisiana, Lavaca Bay (4) and Sabine Pass (9), Texas, Elba Island (5), Georgia, and Jacksonvile (14), Florida, as well as Coos Bay (1) and Astoria (3), Oregon, plus two in Kitimat (15 and 17) and one on Douglas Island (16), British Columbia. One of those proposed BC LNG export terminals is where Spectra Energy proposes to build not one but two pipelines. And even that ain’t all. 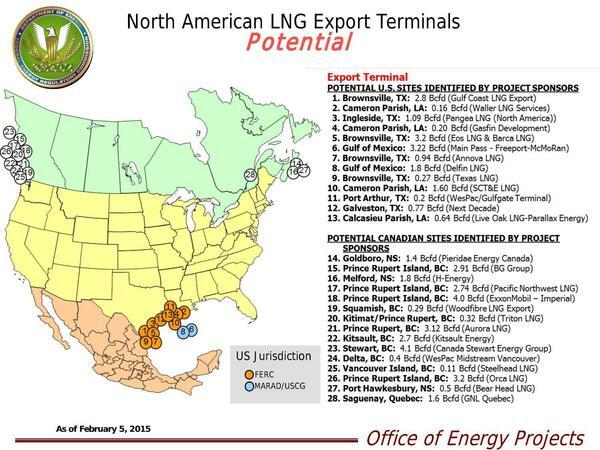 See this FERC map of Potential North American LNG Export Terminals, which includes a bunch more in Louisiana and Texas, as well as the infamous one in Goldboro (14) and two others in Nova Scotia, as well as one in Quebec (28) and eleven in British Columbia. 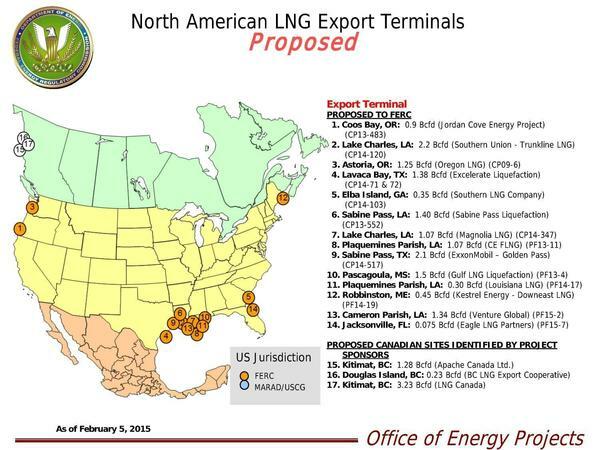 Now that one could have a bit of trouble exporting if Port Dolphin succeeds in importing, because Carib’s Martin County LNG would most likely get its gas from Sabal Trail. 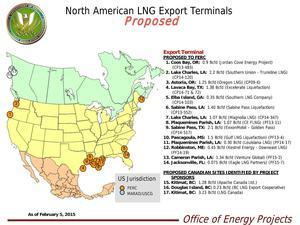 The LNG export boom may be going bust anyway. How about we call off the whole fracked methane boondoggle and power Florida with sun, wind, and water?